Semiology and Structuralism, the two interrelated theories of words and images as different kinds of signs or ways of making meaning, was properly established and determined in the 1970’s predominantly by Ferdinand de Saussure. The theory focuses on how a film doesn’t necessarily have grammar or a vocabulary, but it has a system of signs, the ‘signifiers’ and the ‘signified’. In its simplicity, film images are loaded with signs and symbols for us, the audience, to decipher and interpret our own meanings. For example, a white dress worn by a female character would be the signifier, and our interpretation that the character is a virgin, would be the signified. When applying this theory to the French film, ‘Delicatessen’ (Dir. Jean-Pierre Jeunet and Marc Caro, France, 1991), it helps us as an audience to understand the films representation of the post-holocaust period in France in which the film is set. By retracting meaning from various images in the film, the audience can derive a personal depth and understanding, from an already deep and complicated plot. The film is, in retrospect, trying to explain to the audience the enormity of the devastation caused by the holocaust, not only in France but around the world. The Second World War, from its beginning, had involved every country, and therefore effected every country. ‘Delicatessen’ focuses on a number of issues, predominantly rationing, underground movements and methods of killing, all of which are signifiers of the war, and portrays these issues through the different characters. is established extremely well in the opening scene. The mis-en-scene is very dark and dismal, with abandoned, derelict streets, broken fences and buildings in ruins, suggesting that France has been completely devastated, in all respects. There is a thick, cloudy, yellow atmosphere, which remains throughout most of the film, which signifies to the audience that the air is poisonous and toxic. 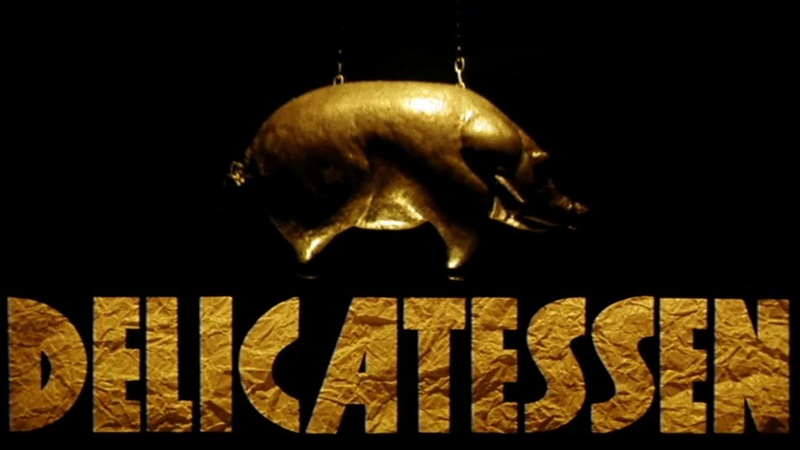 In the same scene, we are introduced to a building, the delicatessen or butchers, which we realise will be the films central focus as it shares its name with the title of the film, and a man who we presume is the butcher. He is shown sharpening a meat cleaver, which instantaneously signifies that the man is dangerous and sinister, and thus creates a feeling of fear amongst the audience. The camera follows the sound of the cleaver through various echoing vents, to a man on the receiving end, who appears to become agitated and scared by the noise, thus signifying that the butcher is a threat to him. As the man tries to escape in a rubbish bin, he is found by the butcher and killed, which we later realise, is for meat. In terms of signifying an element of the Second World War, like Hitler, the butcher is the fascist dictator in their small society. He is a very powerful man, not simply in his size but his mind as well. 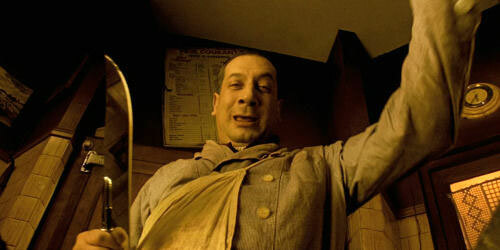 He is presented using various low angle shots in the film, signifying his superiority over the other characters. Throughout the film, his presence is felt in every scene, by the characters themselves as well as the audience, as everyone is petrified of him. Although he is saving them by providing them with food, a place to stay, and in some cases, a job, they all know that he could take that away from them at any moment, as well as their lives. It is worth mentioning at this juncture, the music in the title sequence that follows the opening scene that I have mentioned. It is very happy, and somewhat, comical music, which is quite ironic considering the subjects addressed in the scene beforehand, and signifies to the audience that the film may be quite eccentric, and an exaggerated take on the reality of the holocaust period that it is attempting to portray. One of the central issues raised in ‘Delicatessen’, which is a clear signifier of the Second World War, is rationing. Due to the value of most currencies going down during the war, and not revitalising themselves properly until the early 1950’s, the economies of every country suffered greatly, therefore food, drink, clothes and other basic amenities, were scarce. This issue is well represented in the film, and somewhat exaggerated, through cannibalism. In other words, he sells his customers human meat, which they in fact know about. This signifies to the audience how incredibly desperate and starving the people of the world were before, during and after the holocaust, not simply in the lives of the characters, but of those who actually lived through those conditions in real life. When he talks about his partner at the circus being eaten, the audience realises that Julie does not seem fazed by the notion of cannibalism at all. Each one of the scenes mentioned, signifies what lengths people were willing to got to, so as not to starve to death. Although there is little evidentiary support that cannibalism itself ever happened during the Second World War, there is the suggestion of it. Another issue addressed in ‘Delicatessen’, is underground movements. This is signified clearly, and fitting with the historical period that the film is set in, as there were many underground movements, or non-conformists as some may call them, during World War Two. As Hitler’s army grew and the threat of a fascist dictatorship began to truly terrify some people, underground movements, or simply those who did not believe in fascism, began to break out across many different countries. They developed in towns, cities, and prisons, as well as amongst members of the army. Although Hitler and his Gestapo led many to their deaths, some remained hidden and survived the war. The underground movement within the film, ‘the troglodytes’, are a band of vegetarian freedom fighters. 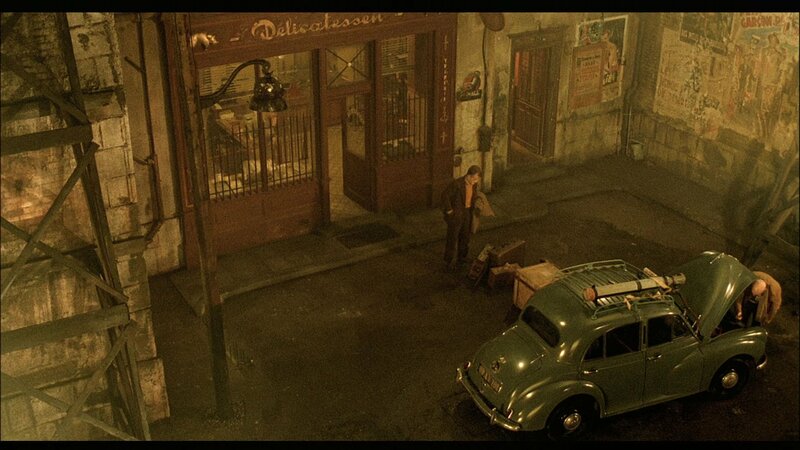 The fact that they are vegetarians, and the residents of the delicatessen are carnivores, signifies that Jeunet and Caro are trying to represent the opposing sides of the war, the fascists and the capitalists, through another, somewhat eccentric, group of oppositions. The troglodytes are essentially outlaws, who have chosen to live in the sewers and underground tunnels of France, escaping some of the toxic atmosphere above them. 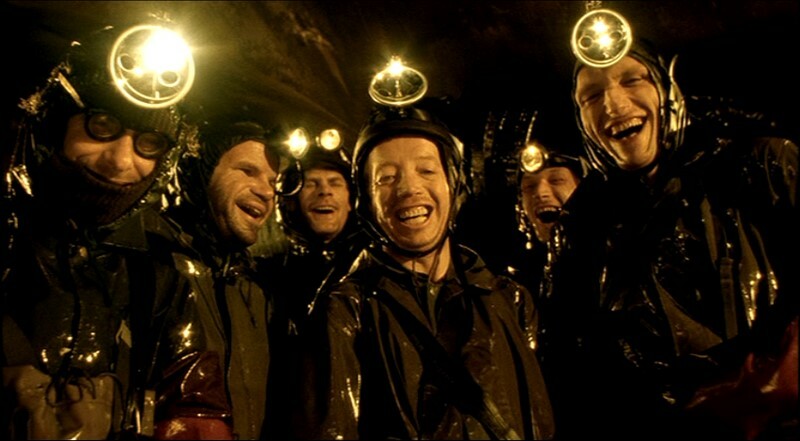 The sewers, drains and pipes in the film, are signifiers in themselves of the underground movements and spying. Due to how much sound can travel through them, they allow a person to hear things that they should not, which is technically spying. This signifies many areas of the Second World War, in which spying was crucial in obtaining information about the opposing sides whereabouts and plans of action, which tended to happen a lot amongst a sides own government. Despite the complexity of the scene, with so many suicide methods being used, it signifies just how many inhumane ways there are of dying, and how many were actually used by Hitler. The end of the film is in fact a signifier of the end of the Second World War. When Louison and Julie try to escape, they flood the room that they are trapped in, making the door burst open, and sending the residents tumbling down the stairs. The water, and the washing away of the ‘carnivores’, signifies the end of Hitler and the Nazi’s, as the bad element in their society is being washed away. Louison and Julie are then shown on the roof of the delicatessen, playing their instruments, whilst the blue sky can be seen in the background. This atmospheric change is also a signifier that the bad element in their lives has gone. However, even if the ‘theory’ had not been developed, people’s freedom to interpret a film would still remain, and therefore, technically speaking, the theory would remain as its basis does. In conclusion, when the theory of ‘Semiotics and Structuralism’ is applied to Jeunet and Caro’s ‘Delicatessen’, it successfully signifies the intended historical context of the period that the film is set in. The directors include a large amount of signifiers of the Second World War and the holocaust, which creates a terrifying, yet eccentric, representation of the Fascist dictatorship. The theory of the semiotic image, allows human intervention to determine the films overall purpose and meaning, rather than simply accepting its pre-given qualities.